Functional non-wetting materials are of interest for a diverse array of applications. Factors contributing to the wettability of a surface include surface free energy and surface roughness. More recently, surface texture has been found to be of equal or greater importance, especially for surface that repel low surface tension liquids, such as short-chain hydrocarbons and alcohols. 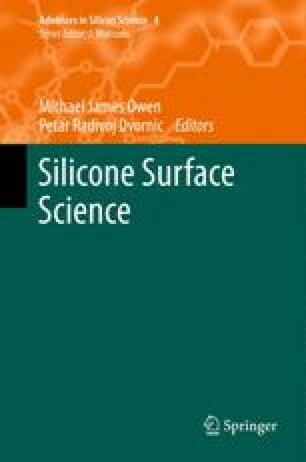 This chapter describes recent work in the design and production of wetting-resistant surfaces utilizing fluorinated Polyhedral Oligomeric SilSesquioxanes (FluoroPOSS), as well as the development of dimensionless design parameters to aid in the preparation of such surfaces. FluoroPOSS compounds are organic/inorganic hybrid materials that exhibit low surface energy attributes, as well as an octahedral structure, which results in useful migration and aggregation characteristics when blended into polymer matrices. Wetting-resistant surfaces containing FluoroPOSS are produced either by techniques that specifically incorporate all three critical parameters for wetting-resistance, or by the modification of substrates already possessing the desired surface texture. Created within the capacity of an US governmental employment and therefore public domain. Published by Springer Netherlands. We thank Dr. Charles Y.-C. Lee and the Air Force Office of Scientific Research (AFOSR) for financial support under grants FA9550-10-1-0523 and LRIR-92PL0COR. We also thank the Air Force Research Laboratory, Propulsion Directorate for their financial support. We also thank Prof. Robert E. Cohen, Prof. Gareth H. McKinley, and Prof. Wonjae Choi for their contributions to this work and helpful conversations.